The Heart of Washington, D.C. This unique two-year program provides training and development for students in writing for a variety of genres, including opera, musical theatre, dance, and incidental music for drama. Through private lessons, group workshops, coursework and performance of a culminating thesis project, students develop the special skills required for writing in theatrical or collaborative contexts, and apply them through practical work. This program was developed both in response to a perceived lack of formal training for composers who are interested in writing in non-concert genres, and to the availability of a large community of musical theater, opera, dance, film, and other artists working both at Catholic University and in the Washington, D.C. The M.M. in Composition, Stage Music Emphasis program opened in fall 2005: students in the program since then have collaborated with student playwrights and directors in the Department of Drama to compose incidental music and sound design for theatrical productions, have worked with choreographers and dancers, and have been involved in musical preparation for musical theater and operatic productions at the Rome School of Music, Drama, and Art. Graduates of the program have gone on to professional positions as university faculty and in professional theater. Since the program's opening, Stage Music composers have heard their music performed at the Kennedy Center for the Performing Arts, the Capital Fringe Festival, Opera North (Philadelphia), the Virginia Arts Festival, the ATLAS Performing Arts Center, and many other theaters and performing venues in the D.C. metro area and beyond. Required for all M.M. students is the successful completion of comprehensive examinations in the areas of theory and analysis, and repertoire and compositional practice post-1900. The Catholic University of America offers many opportunities for students inside and outside the campus. With seven different specialized libraries, state-of-the-art laboratories with specialized equipment, 22 research centers and facilities, and a location inside the nation’s capital that provides many opportunities for internships and research in a wide spectrum of fields and organizations, The Catholic University of America is one of a kind. Located in the heart of Washington, D.C., The Catholic University of America offers unparalleled opportunities. The seat of government of the world’s most influential nation is a magnet for businesses, foundations, aid agencies, science and technology centers, think tanks, charities, research institutes, cultural organizations, and policy advocates. For every area of academic pursuit, there are stories of students finding ways to connect, to make a difference, to open doors, and to have an impact here in the heart of our nation’s culture. 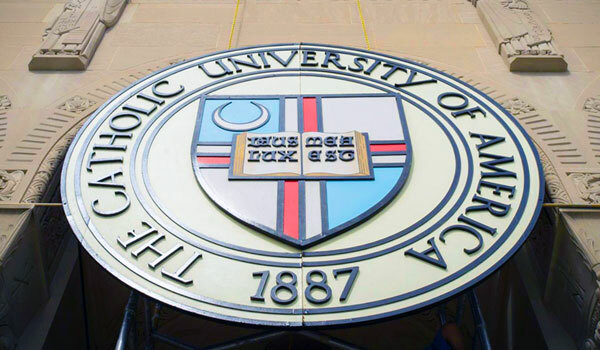 The Catholic University of America offers graduate students a wide variety of funding, teaching assistantships, on-campus employment, and research opportunities. Please contact the department of your interest and ask about funding and teaching opportunities.